Thru the array of hundreds of magazines some fifteen months ago, there unexpectedly glimmered forth the Street and Smith Astounding Stories. Thousands of us saw it and wondered if it were a harbinger of better things to come for lovers of good science fiction. For one month, for two, we bought and read this magazine, with fear balancing our hope. And then, in December, 1932, we definitely knew, as there appeared “Ancestral Voices,” the first thought-variant story, that we were witnessing the birth of a new era in science fiction. 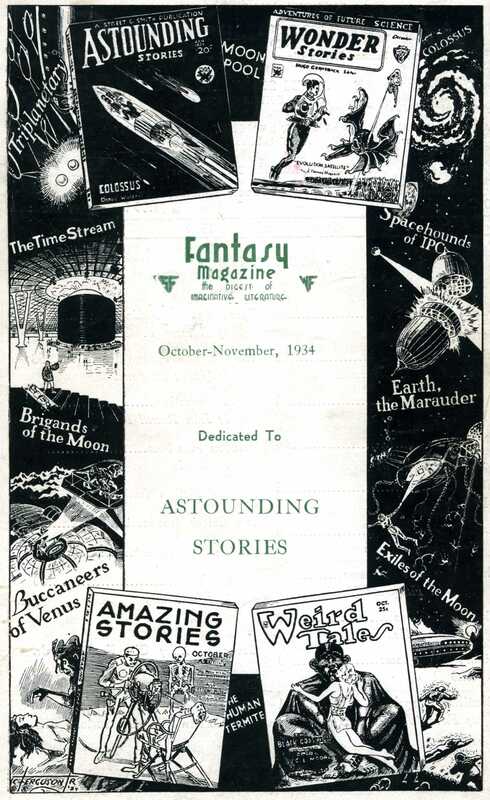 For having done so much for furthering the cause of good science fiction it gives us great pleasure to dedicate this issue of FANTASY MAGAZINE to Astounding Stories… we must honor Street and Smith for not only having the courage to revive Astounding Stories after it failed as a Clayton Magazine, but also for seeing fit to pay higher rates to its authors than any other science fiction magazine. The reference to “thought-variant” stories highlighted what was seen as a significant development in the genre. The idea was described by Astounding Stories editor F. Orlin Tremaine as stories that should each focus on an idea that “has been slurred over or passed by in many, many stories.” This marked an attempt to turn from the action-adventure “space opera” stories that had largely dominated sci-fi. Although the quality of these stories was inconsistent, other publications followed suit and the concept arguably helped lead to more thoughtful work by later authors. This issue’s Cosmos chapter featured yet another substitute author. This was announced tersely in Ray Palmer’s column. “Eando Binder” was the pseudonym adopted by a pair of brothers who wrote collaboratively, Earl Andrew and Otto (E-and-O) Binder. The pair was prolific through the 1930s and 1940s. Next month Edmond Hamilton will bring COSMOS to a sensational stupendous finish. One could get the sense that the editors understood that Cosmos stood in stark contrast to the emerging thread of “thought-variant” tales, and represented more the past of science fiction than its future. Read about the December, 1934 – January 1935 issue.